Marriages break up in different ways. Some marriages erode while the couple is living together and others dissolve after there's been a separation. At some point, the husband and wife start living apart, sometimes in different cities and states. Getting divorced while you and your spouse live in different states is a bit more complicated than getting divorced when you live in the same community. Jurisdiction represents a court's authority over your marriage. Each state has its own rules about jurisdiction. For example, if a husband and wife live in Ohio, a California court does not have jurisdiction over their marriage; therefore, the Ohio couple cannot get a divorce in a California court. If the spouses live in two different states, each respective state's law determines when a spouse can file for a divorce. Each state requires that an individual establish residency within its borders before filing for divorce in that state. An individual must reside in California, for instance, for at least six months before she can file for divorce. California also requires that either the husband or the wife live in the county where the divorce is filed for a minimum of three months before filing. If both spouses move to different counties in California, even if they are lifelong California residents, they have to wait three months before filing for divorce in either of their respective new counties of residence. Assuming each spouse meets the residency requirement of the state where they live, two different states are eligible to have jurisdiction over one marriage. In that event, the state where a divorce petition is first filed is the state that takes jurisdiction over the proceedings and administers and finalizes the couple's divorce. For example, a husband could have a Colorado divorce proceeding dismissed if his wife filed for divorce in Colorado after he filed for divorce in Texas, assuming each spouse had established residency in their respective home states. Once the case is filed, the process for getting divorced in different states is much the same as the process for getting divorced in one state. The spouse who filed for divorce will serve the divorce petition on the out-of-state spouse and the out-of-state spouse will have an opportunity to respond to the petition. The out-of-state spouse may have to hire an attorney in the state where the divorce is pending if she wants to contest the divorce and may also have travel to the out-of-state courthouse to participate in hearings and the trial. If a couple has a short-term marriage with no children and no substantial assets, it may not matter which state handles their divorce. However, state law can make a substantial difference if a marriage involves child custody, child support, spousal support and division of valuable property. States have different formulas for determining the amount of child support one parent pays to the other. In some states, child support can extend beyond adulthood if a child is in college. In addition, some states treat marital property as community property, to be automatically split 50/50, whereas other states use an equitable distribution approach, dividing property in a manner that is fair and equitable under the circumstances rather than strictly down the middle. 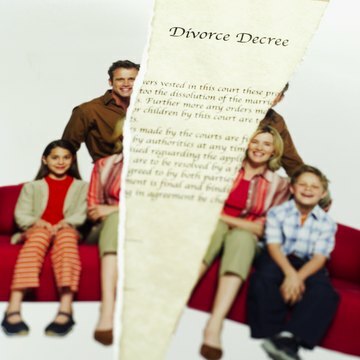 A divorce lawyer in the state where you live can advise you of the benefits of filing for divorce in either state. Your situation may be different if you are filing for dissolution of a domestic partnership instead of a marriage. For example, under California law, if a couple registers their domestic partnership in California, only the state of California can dissolve the partnership, even if neither partner lives in California. The best way to find out how to dissolve your domestic partnership if you and your partner live in different states is to consult a family law attorney. Divorce law varies from state to state, but each state has a procedure for dismissing a divorce case. The reasons for a dismissal may be slightly different in different jurisdictions, but certain events, such as reconciliation and not serving papers on the other spouse, form the basis of dismissal.